As is often the case, another article, and in this case, the image attached tripped the trigger on my muse to pound out another blog post. The HBR article, “Survey: 68% of CEOs Admit They Weren’t Fully Prepared for the Job” made several references about the difficulty CEOs have in shifting the culture in their organizations. What wasn’t articulated made me wonder, “Culture related to What?” How do you decide on a culture? How do you demonstrate it? How do you attain it? Is attaining a culture the end-game, or is sustaining it the brass ring? Leading by example seems to me to be a logical path to consider on this journey, especially when it’s headed into the cloud. Granted there are many moving parts that either comprise a thriving culture or influence the sustainability of one. Leading by example, to me, implies senior leadership takes visible steps that impact everyone who is to be a part of…or recipient of the benefits during the pursuit of this culture effort. “Where does leadership begin?” was part of the article. Methinks overtly engaging the workforce is a reasonable plan of attack. I’ve read recent articles about “engagement” and the approaches considered to accomplish this outcome. My belief is simple and straight-forward…enable your workforce to be successful at their respective Points-of-Work…enable them to be successful in their jobs. Enable their performance capabilities at their respective Points-of-Work and at their discreet moments of need. Not to over simplify, but who among us does not want to be successful in whatever job role assigned? Enable Capability to be successful at Point-of-Work! Are there any mainstream organizations NOT headed to the cloud? If not there already, many are in progress, or at least figuring out where to begin. What aspects of this transformation are not going to introduce disruption to the workforce in the form of changes to workflows and processes…and potentially launching brand new technology integrations? What’s at risk during these transformations? Workforce performance is likely safe bet…at least initially. Why not take steps to minimize or eliminate this disruption as opposed to attempting to train away its inevitability? I’m not suggesting we stop training, but I am suggesting we bring Point-of-Work into training. Our current paradigm and learning technologies do not support the creation of content or management of the content or the delivery of the content at both ends of the Learning Performance Continuum. That said, it follows that we not only need to enable digital transformation we need to enable digital learning and support from Point-of-Entry to Point-of-Work. If this transformation is taking place as rapidly as the articles and predictions I’ve read about say it is, there is a foundational technology that has become exponentially relevant – Cloud-based Digital Performance Support – DPS. DPS provides capability enablement at both Point-of-Work and moment of need across all systems transitioning to the cloud. Being system agnostic, one DPS platform has the ability to scale…as the enterprise transformation scales…and as the user population scales. 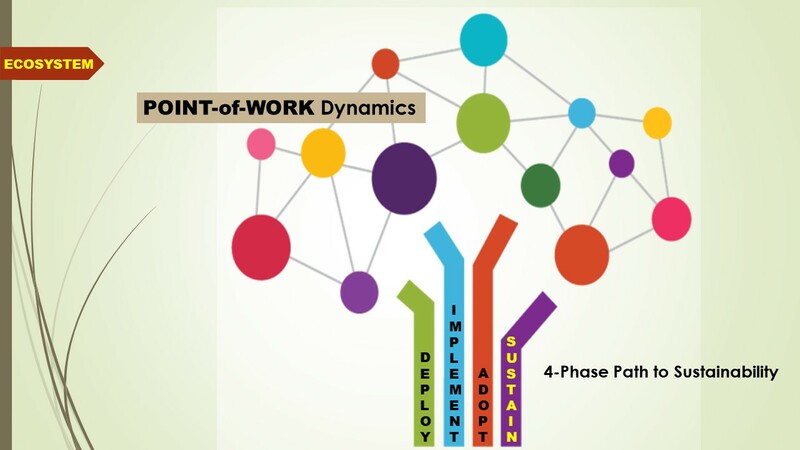 Beyond enabling workforce capability at Point-of-Work, DPS uses collaborative authoring and cross-platform recording to create and manage content for both training at Point-of-Entry (onboarding) to sustaining competent performance at Point-of-Work. In other words, DPS is a single, cloud-based platform that covers the entire Learning Performance Ecosystem…at scale. That is my definition of leading by example. Call it a culture of success. Call it a culture of engagement. Call it a culture of empathy…just read about this last week…people want to be part of an organization that demonstrates “caring”. What demonstrates caring more than enabling capability across the job roles that drive business performance? If it was my decision to make as a CEO, it would be to build a foundation for digital transformation with the single digital technology that can sustain the successful adoption of this multi-faceted, business-critical mission – DPS. Thanks for reading! As always, I welcome your thoughts!